DGJ Organics is a haircare brand which was established 10 years ago by celebrity hairdresser and colourist Daniel Galvin Junior. Their range contains organic natural active components, vitamins and minerals that benefit and help to protect hair. 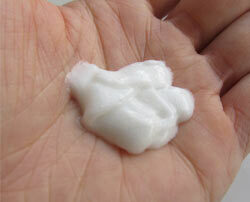 Their products are also free from parabens, Sodium Lauryl Sulfate (SLS) and Sodium Laureth Sulfate (SLES). I was sent a range of shampoos and conditioners to try and in this post, I review their Hairjuice Clarifying Shampoo*, Hairjuice Clarifying Conditioner* and Hangover Hair Repair treatment*. I’ve also received Glossy Blondes Shampoo and Glossy Blondes Conditioner, which I am yet to test and I will write a review about these two products separately. DGJ Organics are an affordable haircare brand which caters for the whole family and you can buy their products directly from Waitrose. In their range, you will find products for blondes, brunettes, men and children. Whatever your hair type DGJ Organics seem to have a product for you. I also noticed that they sell Hair Colour Remover so if you are looking to remove artificial hair dye safely you could give this a try but no ingredients are listed on their website. This shampoo is designed for hair which feels extra greasy, weighed down, dull, limp and difficult to comb. I have fine hair which gets greasy very quickly and at the same time, it’s very difficult to manage after I wash it. I also get itchy and irritated scalp which I believe is linked to stress and lack of certain nutrients in my diet. At the same time my ends feel dry and I know it’s because my hair is quite long and a haircut is due (but I am delaying it as much as possible as I love it long!) I was really interested to see how would DGJ Organics shampoo and conditioner together help with each of my hair concerns. While smell, texture and colour is not that important to me (as long as it works! ), I still wanted to mention it as some may want to know. The shampoo has a pleasant smell and this must be probably due to its organic mandarin essential oils and rose extracts. It has a jelly-like texture with clear colours which you can see in the picture below. When I use it, it doesn’t lather as much during the first wash as it does during the second wash which is quite common for most of the shampoos I’ve used in the past. Considering the fact that it doesn’t contain SLSs it lathers very well and better than some of the more natural shampoos I’ve tried in the past. After I use it my hair feels squeaky clean and it definitely removes any grime and dirt very well leaving the hair fresh and clean. When my hair is wet after shampooing, it already feels softer and more manageable. You won’t find a full list of ingredients on DGJ Organics website and I couldn’t find them online so I decided to share them with you here. It’s a quite long list actually and you may not agree with some. 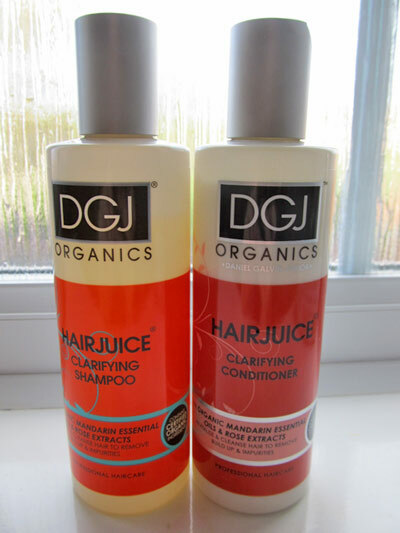 DGJ Organics Hairjuice Clarifying Shampoo is really affordable and it’s sold in a 250ml bottle which costs less than £10. I found Hairjuice Clarifiying Conditioner (the same size and price as shampoo) had less pleasant smell and I am not sure why, but what mattered to me more was the results. It is white in colour as you can see in the picture below. The conditioner contains exactly the same essential oils and organic ingredients as the clarifying shampoo only that the list of all of the ingredients is slightly less lengthy. Aqua, Aloe Barbadensis Leaf Juice*, Cetearyl Alcohol, Cetrimonium Chloride, Cocamidopropyl Betaine, Dehydroacetic Acid, Benzyl Alcohol, Citric Acid, Parfum, Niacinamide, Calcium Pantothenate, Sodium Ascorbyl Phosphate, Tocopheryl Acetate, Pyridoxine HCL, Maltodextrin, Sodium Starch Octenylsuccinate, Silica, Hydroxypropyltrimonium Honey, Citrus Nobilis (Mandarin) Peel Oil*, Rosa Damascena (rose) Extract*, Hydroxypropyltrimonium Hydrolyzed Wheat Protein, Potassium Sorbate, Sodium Benzoate, Linalool, Limonene. I would leave the conditioner sit on my hair for about 5-10 minutes before rinsing it. You need to remember to apply it only to from mid-lengths downward, otherwise, your hair may feel greasy pretty quickly after using it. During the rinse, I already feel how soft my hair is and I can see the full effect of both shampoo and conditioner after I dry my hair. These products make my hair much more manageable and easier to comb. 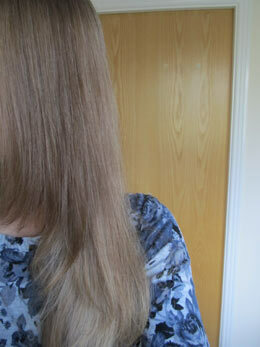 My hair also feels softer, lighter and it looks nice and shiny. 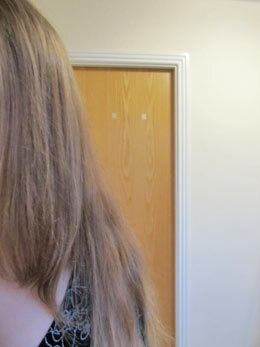 I almost look like I had a blow dry which I never do anyway (I can’t be bothered!) so it’s a really nice effect. The products also seemed to have soothed my scalp and the scalp didn’t feel as itchy after using them. You can see how great my hair looks in the picture below. I took one picture of my hair after I’ve used one of the other more natural shampoos and conditioners I use and you can really see the difference it makes to my hair below. I tend to have so many flyaways and DGJ Organics products really help with this issue. DGJ Organics Hangover Hair is an intensive conditioning repair and gloss treatment and it’s suitable for times when your hair needs some extra TLC. It could be your lifestyle, diet or pollution that make your hair a little bit dull, lifeless and in need of some special treatment. This intensive conditioning repair and gloss treatment contains wheat protein, coconut derived extracts, vitamins, honey and organic lavender to detoxify and revitalise all hair types, leaving your hair glossy and full of shine. You are meant to leave this product in your hair for about 10-20 minutes so that your hair can fully benefit from it. To be honest, I normally don’t have that much time but when I tried it, I did leave it on for at least 5-10 minutes. The effect was similar to Hairjuice Clarifying Conditioner but I am sure if I left it on longer, my hair would possibly look and feel even better. I think it’s great to use this treatment while you are having a bath and getting all pampered up (which will be once in a while I guess!). 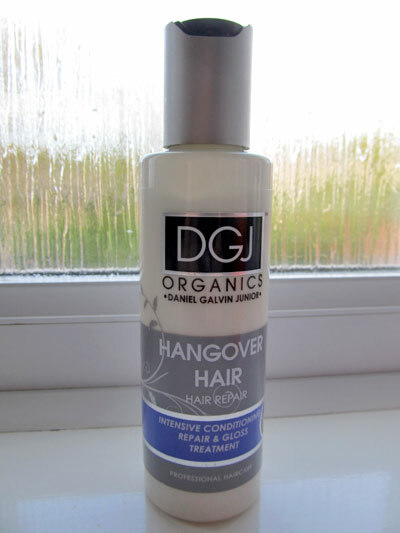 DGJ Organics Hangover Hair comes in a 150ml bottle and you can buy it for £5.49. It has a pleasant smell but after I read its ingredients list I was surprised to find Paraffinum Liquidum – something you don’t normally find in more natural products. Aqua, Aloe Barbadensis Leaf Juice*, Glycerin, Cetrimonium Chloride, Cetearyl Alcohol, Paraffinum Liquidum, PEG-20 Stearate, Phenylpropyldimethylsiloxysilicate, Dehydroacetic Acid, Benzyl Alcohol, Citric Acid, PEG-12 Dimethicone, Parfum, Tocopherol, Hydroxypropyltrimonium Hydrolyzed Wheat Protein, Sambucus Nigra, Equisetum Atvense, Cucumis Melo (Melon) Extract*, Cucumis Sativus (Cucumber) Extract*, Yucca Vera, Amyl Cinnamal, Benzyl Salicyclate, Butylphenyl Methylpropional. I really love the way DGJ Organics products make my hair feel and look and I would continue using them in the future (although not every time I wash my hair). I am not sure about certain ingredients these products contain, but for now I don’t have that strict guidelines for haircare as I do for skincare. For me, it’s enough that these products don’t contain parabens and SLS/SLEs but I may reconsider this in the future. If you are switching from the mainstream haircare products to more natural products DGJ Organics haircare products could be a good start for you. Have you heard of DGJ Organics haircare brand before? If you used any of their products what did you think of them?